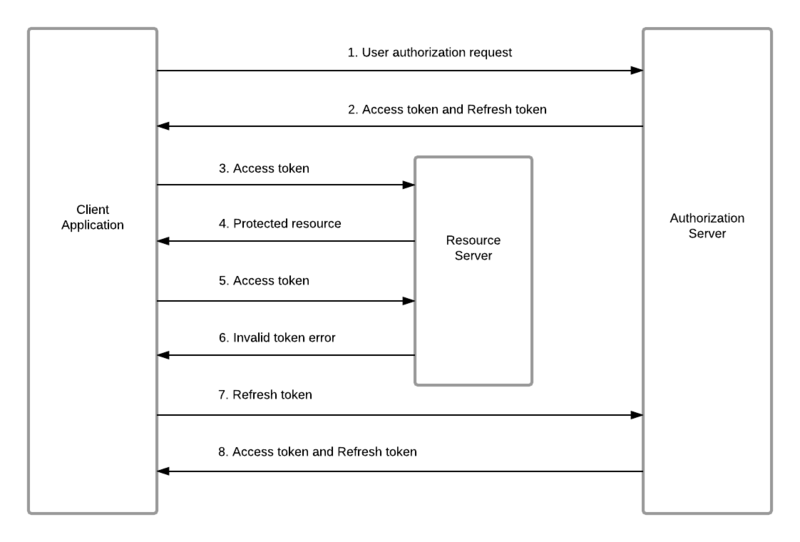 Token base authentication expires over a fixed time, to overcome on it we need to use the refresh token. We will try to create the token as well as the refresh token after successful login, refresh token will be used to generate a new token if current token is already expired and it is not too late. If you are at this page after reading many online articles on how to implement Owin, OAuth, Bearer Token, take a deep breath. We will complete everything step by step until we complete it. How refresh token works? A Refresh Token is a special kind of token that can be used to obtain a renewed access token that allows accessing a protected resource at any time until expire. After 20 minute client again try to access projected token which is already expired. Client receives a new token for 20 minute and a new refresh token for 40 minute. What will happen when user logged in and left the system for 40 or more minutes? When he will try to access the projected resources he will get 401 - Unauthorized, then try to refresh the token but that is also expired so he will again receive 401 - Unauthorized. Means he need to login again! Now he have full picture, how token and refresh token works. Time to write the code and implement the same in logic. Create a new ASP.Net Web Application, give any name you like, click OK, choose Web API, No Authentication and click OK to create the application. Even after these steps it will be showing compilation error for OAuthCustomeTokenProvider and OAuthCustomRefreshTokenProvider because we need to write these two methods. If you don't understand any part of the code, don't be worried, I will provide you complete detail and code at the end of this article. As you note and will not get any code is UserService, this will be your service/repository/class which will be used to authenticate the user id and password. If it is a valid user then we go ahead and add different properties and roles to create the token which can be retrieved at any time latter. Nothing special, just a simple class with some properties. It is just for testing purpose, because I guess, you can create it and authenticate user from database easily. If you feel lost, go back and see OAuthCustomeTokenProvider class and we added on method GrantResourceOwnerCredentials, fix the UserService references. Since we inherited from IAuthenticationTokenProvider interface so we need to implement following methods in this class. We will use only CreateAsync and ReceiveAsync but still we need to implement Create and Receive synchronous methods, so we will throw error from them. This will be used to create a refresh token, which we will use to create a new token on expiry of current token. We completed every thing, now time to fix the startup.cs missing references, open the file and add the using statements for missing namespaces or use CTRL + DOT. Once done try to build and run the application. Let's try to create a token, if you noticed, we use the email as user[N]@dummy.com and password pass[N]. ".expires": "Mon, 08 Oct 2018 15:17:11 GMT"
How to check whether this token is working or not? When we created our application by default Visual Studio created one controller named ValuesController with some action method, let's use that by add [Authorize] attribute on entire controller, so no action method will be called without authentication. We will get error saying "Message": "Authorization has been denied for this request." And now we are getting values properly, it means everything working as we expected. Now how to refresh a token by using our refresh token? And now we will receive a new token and a new refresh token, the same method is getting called so same result will be returned but with new values. I know, I split code to explain method by method so some of you will face problem to get the complete code in proper class, so let me copy to main methods completely as it is working. These two classes are created in Providing folder, project name I used Refresh_Token so you will need to fix the namespace according to your project name and namespace. I would love to have comments to improve anything. Soon I will use the same code to authentication Angular 6 application with complete code, like how to pass token in every HttpRequest, how to use Refresh Token if current token is expired etc. If you will try to call the Web API token method from Angular, it will give CORS error but this will work with Fiddler and Chrome Advance Rest Client or postmaster etc., we will fix this issue when we will use Angular.